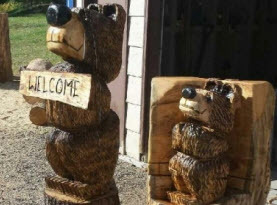 Whether you are looking for Chainsaw Carved bears, dogs, birds, horses, deer, moose, raccoons, ladybugs, turtles, frogs, coyotes, eagles, mountain men and other human figures, mascots, totem poles, furniture such as benches and tables, custom signs or anything else, call today to get your free quote and place your order. When Summer hits Las Vegas, NV it gets a little too hot for chainsaw carving. Lewis heads north to Montana for the Summer to continue to work at his craft. Lewis Clark has been making stunning chainsaw carvings since 1986. 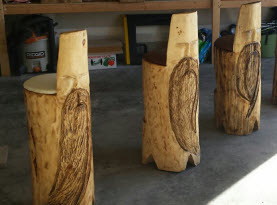 He learned chainsaw carving while in college in Boise, Idaho. During his life he has lived in several Northwest States and now shares his time between Las Vegas and Montana. 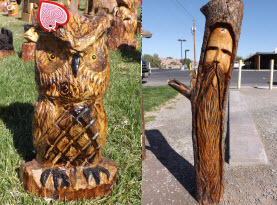 Since he started carving 30 years ago, he has turned raw chunks of wood into works of art using a tool more often associated with knocking trees down than sculpting them into endearing faces and figures. Lewis has sold pieces to people across the Western United States and all over the world. While chainsaw bears are his best selling item, Lewis has carved most everything at one time or another! Lewis’ first chainsaw was an inexpensive model that would leave his arms numb from the vibration. He now owns eight chainsaws modified especially for carving wood. Wood selection is vital to creating a beautiful and long lasting piece of art. While redwood is Lewis’ favorite, it is hard to come by in Montana. A couple of the local woods he most enjoys are ponderosa and cottonwood; both known for soft and straight fibers. 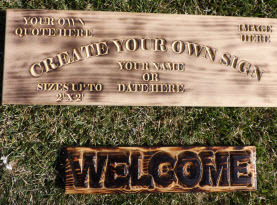 They are easy to carve and not as prone to cracking as other wood types.